You’ve made it. 365 days. You survived your first year of parenthood and that tiny baby that you carried inside of you is now on the brink of toddlerhood. Can you believe it? This is truly a moment to celebrate as a family! Our first birthday sessions are a beautiful & unique way to celebrate your child turning one. It’s the time to document your baby’s budding personality and capture these fleeting milestones. We combine our birthday sessions with family photos to celebrate your first year together. Laughter, tickles, kisses, and lots of giggles always appear in front of my camera! You’ll enjoy 2 or 3 set ups for your little one in the studio with cute little outfit changes and classic props. Our cake smash option is one of our most requested set ups and families love planning a creative session with decor & a cake to match a favorite book, party or nursery theme. The opportunities for creativity are endless! I’m a maker, a do-er, a creative. I love crafting, so after we talk about inspiration for your session, I will create the perfect custom backdrop, a pretty little headband, adorable props and accessories, and the most delicious cake to go along with your session’s theme. 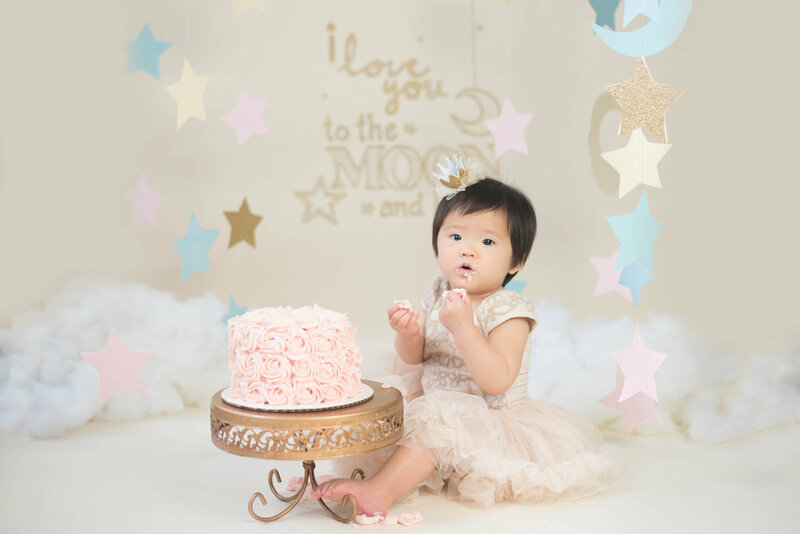 Due to our elaborate set-ups that we create for each cake smash session, all cake smash sessions are done in either our Saratoga Springs photography studio, or our Attleboro studio space. Celebrate every milestone. Become a Baby Plan Member and document your baby’s first year from bump to birthday, and everything in between. Enjoy special products exclusively available for our Baby Plan members, as well as incredible savings on your portrait sessions. Click on the image below to learn more!